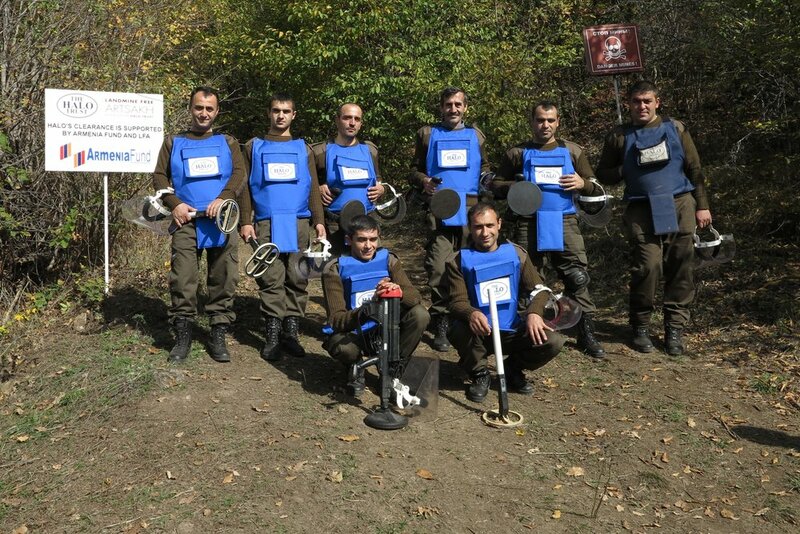 Demining one major minefield that covers 31,839m² of land located 2.5 kilometers from Meghvadzor village in Lachin region (Kashatagh) started in June 2017. Thanks to One Armenia that raised $98,000 to completely fund the work. With the help from neighbors, friends and volunteers, LFA gathered 30 boxes of clothing, toys, shoes and other household items. In June of 2016, a member of the committee - Meline Melconian Marachelian, with the help of the local staff of the HALO Trust distributed the much needed goods to the villagers in landmine affected regions of Hadrut and Matruni. The distribution took place in Norashen village benefiting 12 families and 45 individuals, Govshatly village benefiting four families and 15 individuals and Jivanni village benefiting 38 families and 198 individuals. Chartar city and the field where 30 cluster bombs were cleared, just off the main road! Landmine Free Artsakh is proud to announce that donations totaling $15,000 enabled clearance of Chartar from 30 unexploded cluster bombs covering an area of 27,000m2 (6.7 acres) in August, 2015. Chartar is located in the Martuni region, north of Amaras, where at the beginning of the fifth century Mesrob Mashdots established the first-ever school that used the Armenian alphabet. Having a population of 3,000, Chartar is a city and its 150 farming families are now going back to cultivating their fertile land. The economic benefit will go a long way towards improving the lives of all its residents. LFA and Armenia Fund raised $35,000 for the clearance of the landmines in the village of Karegah in Kashatagh region which completed in December of 2014. Manual teams destroyed 21 Anti Personnel mines and six unexploded ordnance and 16,613 m2 of land was returned to the villagers. Watch this beautiful short video clip narrated by Mrs. Marine Petrossyan, Karegah mayor. Norashenik Village, in Kashatgh (Lachin) Region, was hit by a cluster bomb strike during the war. A few years ago, Virab Shaboian found a cluster bomb whilst playing with his children in the land beside his house. He informed HALO who promptly dispatched a team to destroy the bomb and survey the area. LFA with the help of generous supporters raised $11,000 for the HALO Trust and in October of 2013, the village of Norashenik with a population of 105 and 370 acres of land was completely cleared of 12 cluster bombs and 28 unexploded ordnance.